Welcome to part 2 of this course on the music of Brazil. 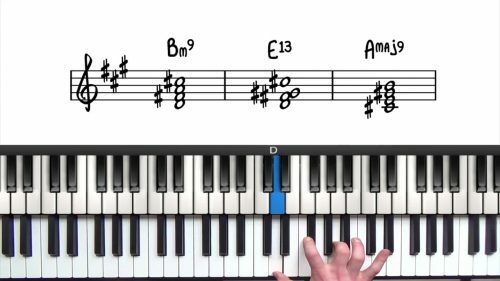 In this lesson, we will break down the rhythms of Bossa Nova and Samba music. We will examine the components of both the right and left-hand and explore the interplay between the drums, the basslines, and the harmony. The left-hand takes the role of the Surdo drum, and the right-hand takes the role of the Tamborim. The bass patterns in Bossa Nova and Samba are driven by the left hand. Samba can be defined as a 2 layer rhythm where 1 rhythm is non-syncopated. The bassline pattern is the non-syncopated element and this is performed by the Surdo drum in the Samba band. If you are used to playing a lot of European inspired music, you might find it unusual to place the emphasis on the 2nd beat. Using western classical music as an example, you will notice that the accents are always on the downbeat. In Brazilian music, the accent is placed on the 2nd beat. The second layer of the Samba is a syncopated line which takes the role of the Tamborim drum. You must have the non-syncopated line of the Surdo in order to achieve the combination of these rhythms. This left-hand bassline gives the right-hand line a reference from which to be syncopated. The ghost notes in the bassline are a very important element of the Samba & Bossa Nova Grooves. In the lesson, we will explore and demonstrate the correct way to play ghost notes, and the incorrect "16th note approach" which is a common slipping point that will ruin the sense of groove. Anticipation is another key ingredient of the groove. When the harmony is being syncopated, we must ensure that the chords do not always fall on the downbeats. This gives you the choice of playing the chords either before, or after the beat. In this style of music, anticipating the chord is more common but both can be effective. Study the examples in this lesson to get the right ‘feel’ and sense of groove when playing this music. 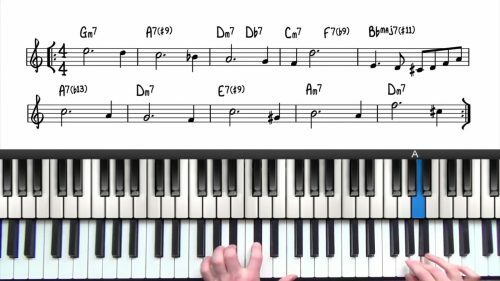 Practice the clapping rhythms outlined in this lesson whilst tapping your foot to the down beat. This will help you understand and 'feel' the syncopated right-hand chords against the non-syncopated left-hand bassline. Once this has been absorbed, then translate the rhythms to the piano. Start by playing a 2 bar vamp over a single chord type. In the lesson, we demonstrate a 2 bar vamp in D Minor. 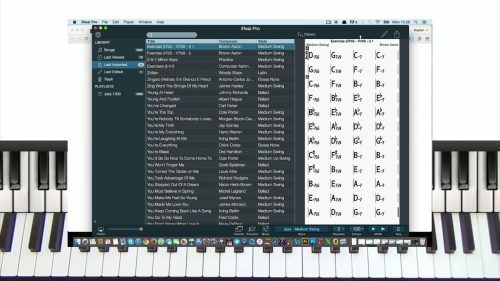 Experiment with the different placement of the right-hand comping chords by playing them on the beat, off the beat, and fully syncopated as demonstrated in the lesson. Next move onto a 2 bar vamp. We will demonstrate using the chords G-7 and C7. Pay attention to the anticipation of the chords. Also, notice the nuances of the demonstrations such as ghost notes and accents on different beats of the bar.